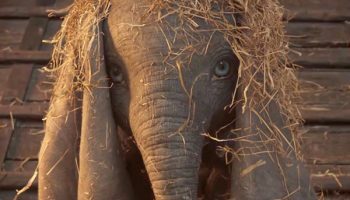 ‘Dumbo’ Movie Review – Spotlight Report "The Best Entertainment Website in Oz"
As an avid Tim Burton fan and admirer of early (pre-princess mania) Disney animation, I had high hopes for the live-action interpretation of Dumbo. 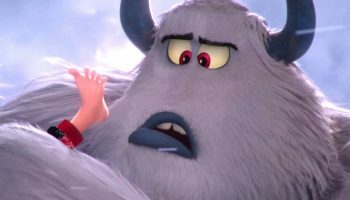 With the film’s concept forming in 2014 and Burton nominated as director and Transformers franchise writer, Ehren Kruger, working on its screenplay, this Disney and Burton co-production should have soared like its pachyderm protagonist. Yet didn’t. 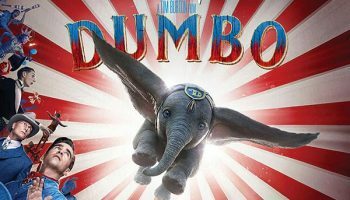 The general premise of the Dumbo story remains: a mother elephant in a circus is separated from her baby, who happens to have been born with exceptionally large ears. Initially a source of clumsiness and derision, Dumbo‘s unique ears enable him to fly. The strong maternal instincts to protect her infant and angry outburst when he’s mistreated leave Dumbo’s mother locked up as a ‘dangerous’ animal. There are plot variances to this in the current version, and instead of Timothy Q. Mouse being Dumbo‘s tiny pal and big motivator, it is Holt Farrier’s (Colin Farrel) children, Milly and Joe (Nico Parker and Finley Hobbins, respectively) who maintain belief in, and encouragement for, Dumbo‘s wondrous ability. Danny DeVito plays the role of the circus ringmaster, Max Medici, a shabby and slightly shoddy person with little business acumen but a heart of gold when it comes to maintaining his troupe of entertainers. Holt Farrier was once part of a husband and wife act, performing on horseback, but World War I and influenza has left him without an arm, nor a partner to hold it. 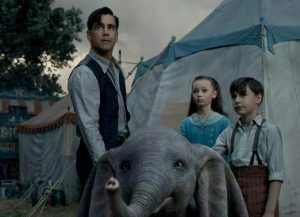 Once back from the trenches, Holt finds most of his possessions gone, a new role of elephant trainer (mainly with a large shovel in hand), and children with no interest in continuing the family tradition of working under the Big Top. Kruger’s screenplay is as elephantine and blunderous as Dumbo on land. The story is stretched tighter than a circus tent, with more diversions than necessary. 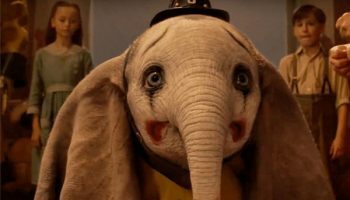 If more focus had been applied to the tight bond between Dumbo and his mother, the film may have proven more successful. Musically, the film score was befitting and complimentary. Danny Elfman, who has composed for many of Burton‘s past productions, provides orchestral sounds and soaring choruses reminiscent of Disney’s golden years. Instrumental versions of a few of the original film’s songs and a retro-sounding, Roy Orbinesque version of “Baby Mine” by Arcade Fire create a sentimental air. Why the original version of this by Norwegian artist, Aurora, was replaced, I’m not sure. It remains in trailer promotions for the movie. There are other features that were irksome: a terrible Afrikaans (?) accent by the baddie/ animal hunter, Neils Skellig (Joseph Gatt), and a steam-punk rendition of technology for the new wonderland circus’ power supply, patronised by V. A.Vandevere, entrepreneur extraordinaire (Michael Keaton). I’m surmising this harks to the Vanderbilt family, once the wealthiest in America. Visually, there are trademark signs of Burton‘s gothic and surreal fancies, as well as the story’s focus on freaks and misfits struggling to be accepted- a Burton trait . Edward Scissorhands is a classic, and successful, example of this. 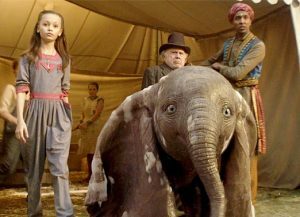 Homages and nods to Disney abound; particularly the ‘Pink Elephants on Parade’ scene and families will probably love this film for its general lack of violence, abundance of sweet animals and determined child characters. Yet, Dumbo did not have me cheering at its end. It all seemed to fall apart, much like the Big Top tent, with a clunky script and numerous, unnecessary subplots. With or without a “magic feather” it did not fly. Max Medici is not the only ringmaster working at a failing show here. As someone who was fired by Disney in the 1980’s for producing children’s content deemed too “scary” for a young audience (Frankenweenie) Tim Burton seems to be obeying the cracking of the whip with this production. Do live-action versions of successful animations have to be done in the first place (cue Aladdin trailer)?